The Lord is Risen! Have a blessed Easter. 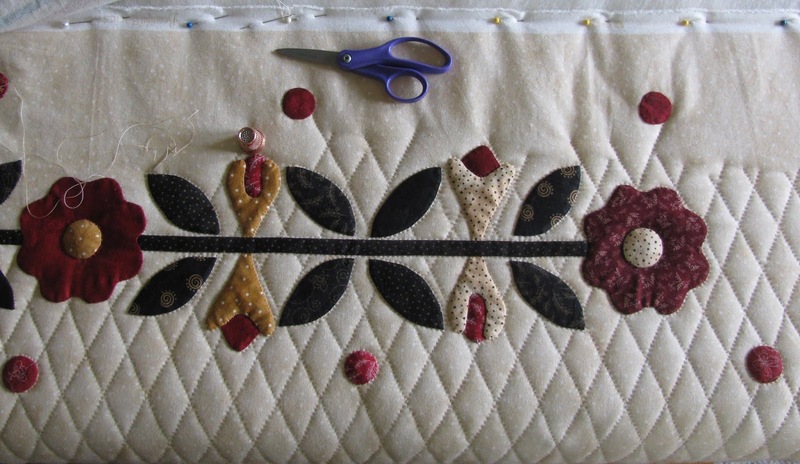 The section of the applique border on the Pastor's Attic quilt is quilted! Now I've rolled and the finishing quilting has started. 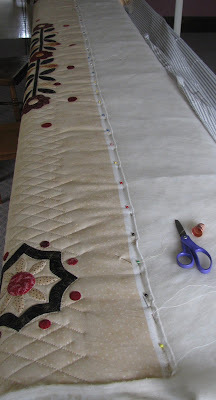 As I quilt, I baste the top edge and remove the pins. I'm sure you've noticed over the months of quilting, that I have left the selvage on the quilt edges. It's so nice to quilt and not have ravelry edges. I know I could zigzag them but leaving the selvages is easier for me. Don't worry. 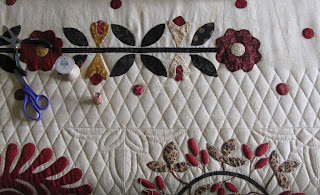 Once the quilting is finished, I will machine stitch, with very tiny stitches, where the edge is supposed to be and then trim off the selvage. Then the binding will happen. This is how far I've gotten with the finishing quilting. Quilting has come to a screeching halt at the moment. I've developed a very sore crack in the back of my right thumb. 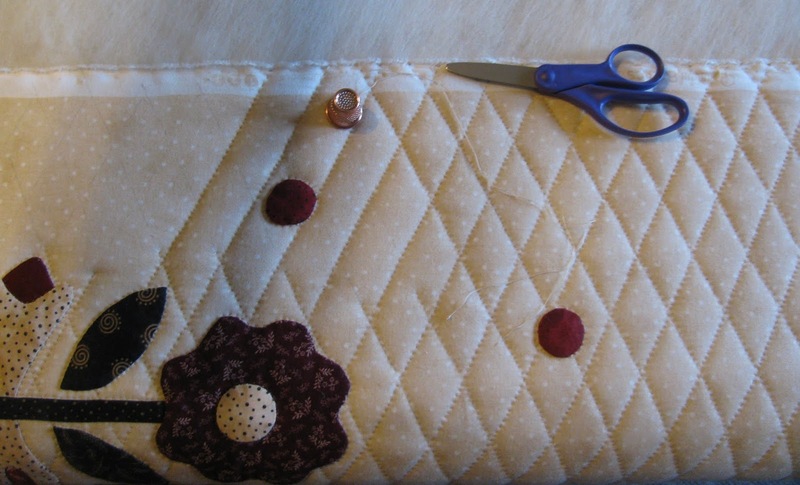 Since I'm right handed I used my right thumb for quilting. So, no quilting until the crack is healed. I know, I need to get some super glue in the crack. That will patch it up good. There won't be a post next Sunday, April 28th. I have a lot going on the first of the week and then leave for the Jane Stickle retreat in Shipshewana Wednesday afternoon. There just isn't going to be much time for hand quilting this week. Good news is my thumb should definitely be healed after a week of rest. Linking to Peacock Party, Kathy's Slow Sunday Stitching, Oh Scrap, Bambi's Show & Tell Monday, Monday Making, Design Wall Monday, Moving It Forward, BOM's Away! I've signed up to join in with the Hands To Help 2019 Challenge. I participate in the MCC Comforter Bash and make comforter tops for them anyway. Two very simple 60" by 80" comforter tops have been completed for this challenge. I don't need to quilt these tops, they'll be knotted. For my pattern, I cut fabrics left from other projects into 5" blocks which I used in the center of each block. 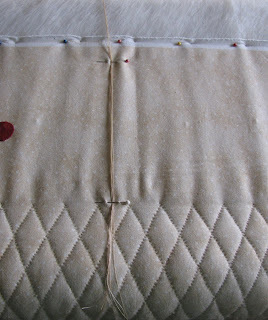 The sashing on the sides are cut at 2-1/2". The block finished at 8 1/2". 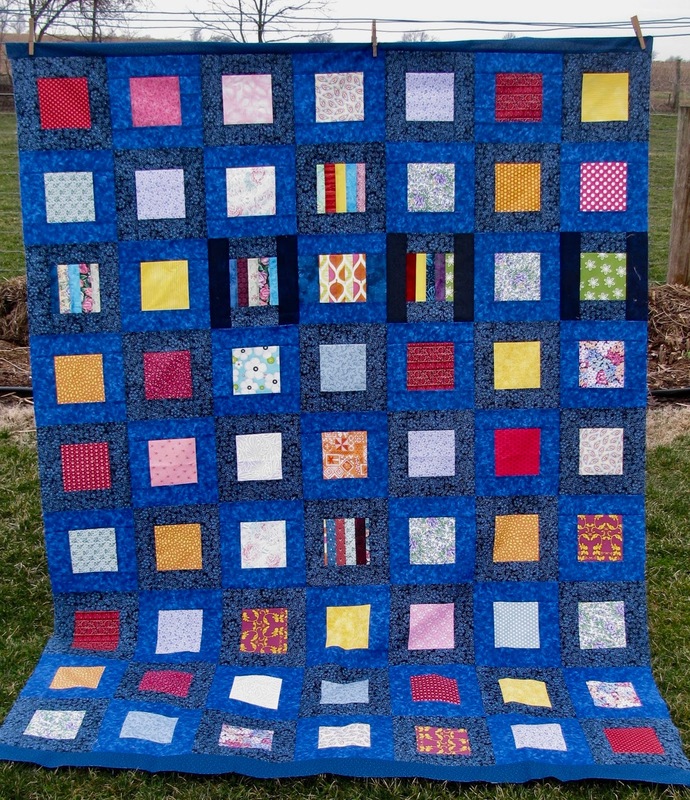 Yes, some of those squares are string blocks, anything goes for the centers. Crumb blocks would be wonderful too. Feel free to use this easy pattern and feel free to modify it for your own use. 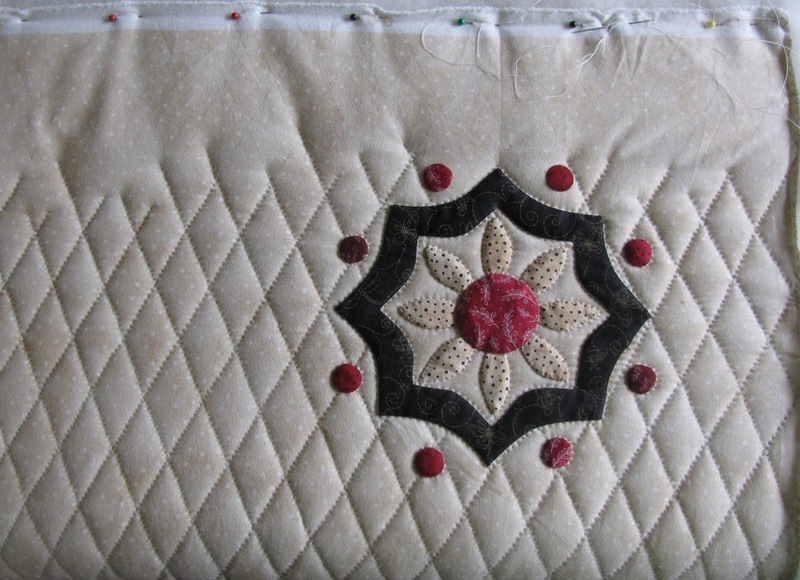 I'm still hand quilting on my Pastor's Attic Quilt. 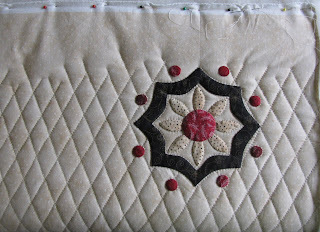 The diamonds between the quilt center and the border applique are quilted. 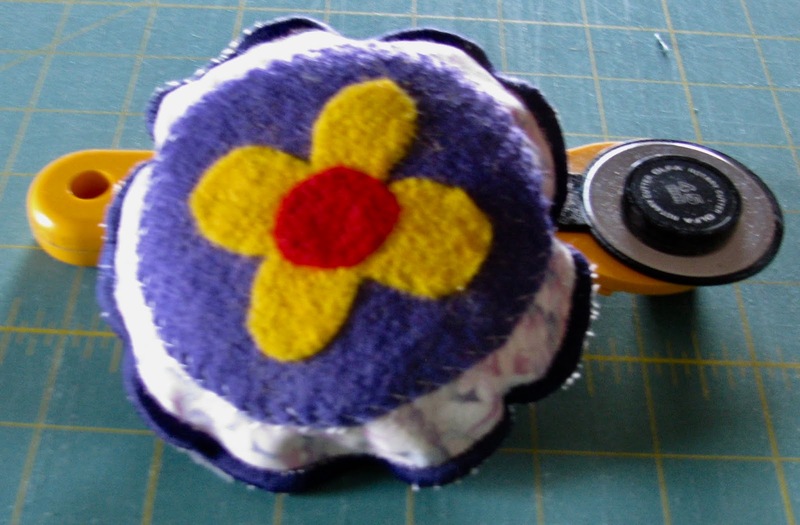 I've rolled and now working on the applique part. I can literally see the the end in sight! The top of the quilt has been unpinned from the header and pinned to the batting and backing fabric. 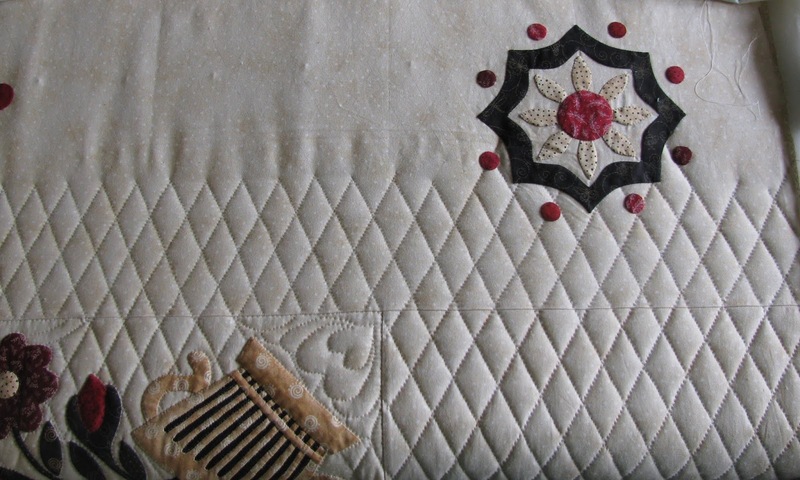 This corner applique is not original to this quilt pattern, the pattern for this applique comes from the 1857 Album Quilt. I downloaded the free patterns from Sentimental Stitches but the pattern is no longer free. The pattern for the whole quilt is available for purchase if you're interested. I did reduce the size of the pattern to fit the corners. The left flower is the center of the border. There are still several weeks of quilting before she's finished. I'm still counting the yards of thread but now I need to measure by the yard and cut it to length. I cut 10 yards at a time in 1 yard measurement. The way I keep it from getting tangled is to pin it to the quilt like this. I pull the individual thread out from the bottom. It slides out by itself and there is no tangling. 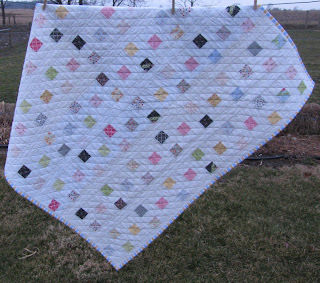 At the guild retreat in February, I pieced a crib quilt flimsy called Wiggly Whimsy. 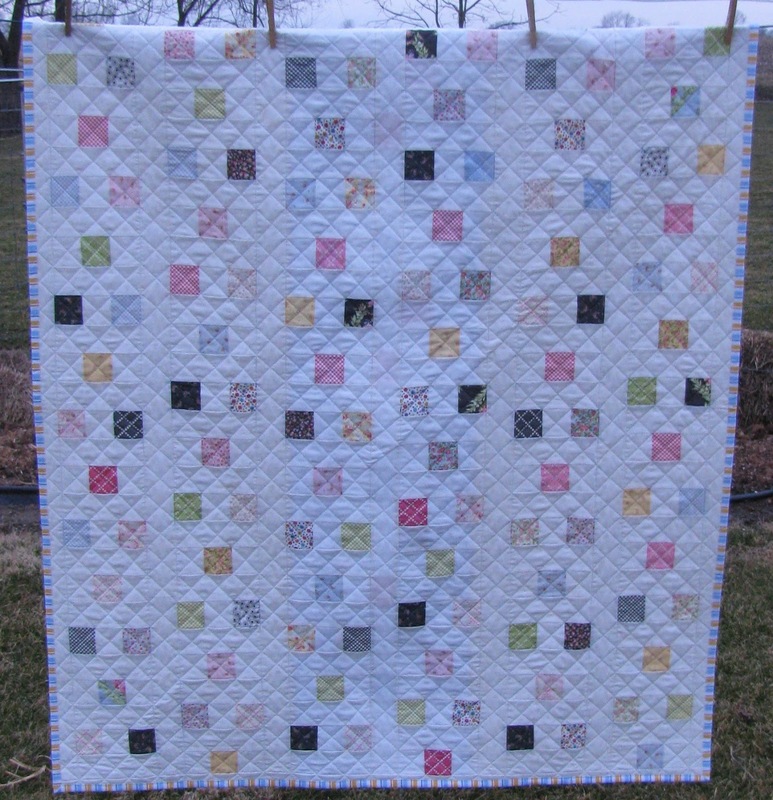 This is a free pattern (recipe) from the Moda Bake Shop which utilizes a charm pack but you can cut your own squares. I've quilted the flimsy with my Elna 720. 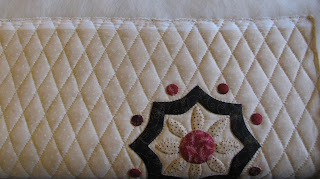 I altered the pattern by not adding one of the pieced rows. I wanted my quilt to be rectangular, not square. 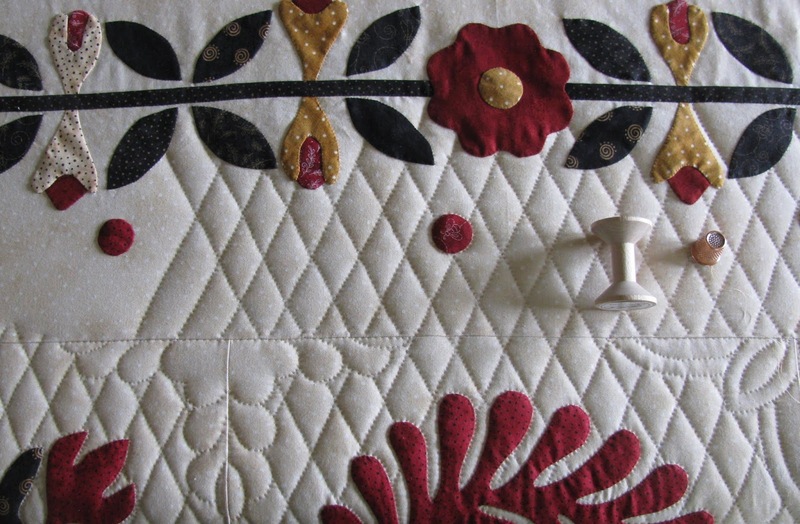 The white in the center of the quilt looks whiter than the sides of the quilt. That's because the backing was pieced. All the white fabric came from the same bolt of Bella Solids. My backing fabric needed to be wider so I added the extra row to the center. Now I won't have the stress of trying to figure out what to do with an unused row. 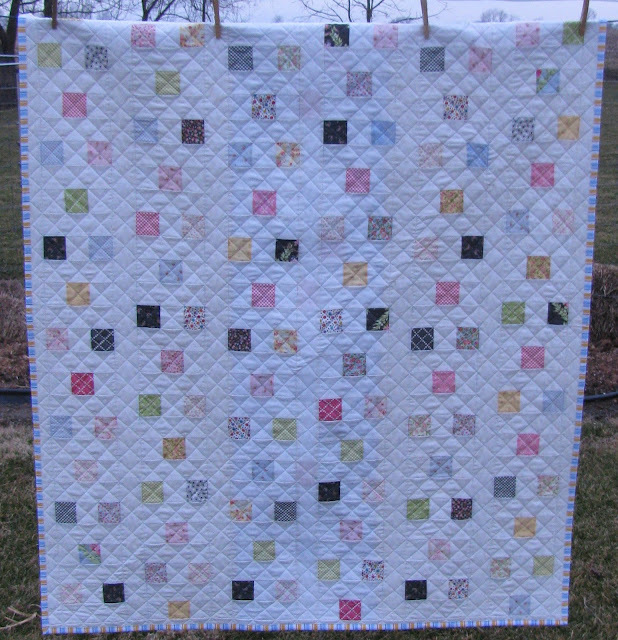 The back is cute in it's own way, it's a reversible quilt! The yellow fabric was left from my Nearly Insane quilt. 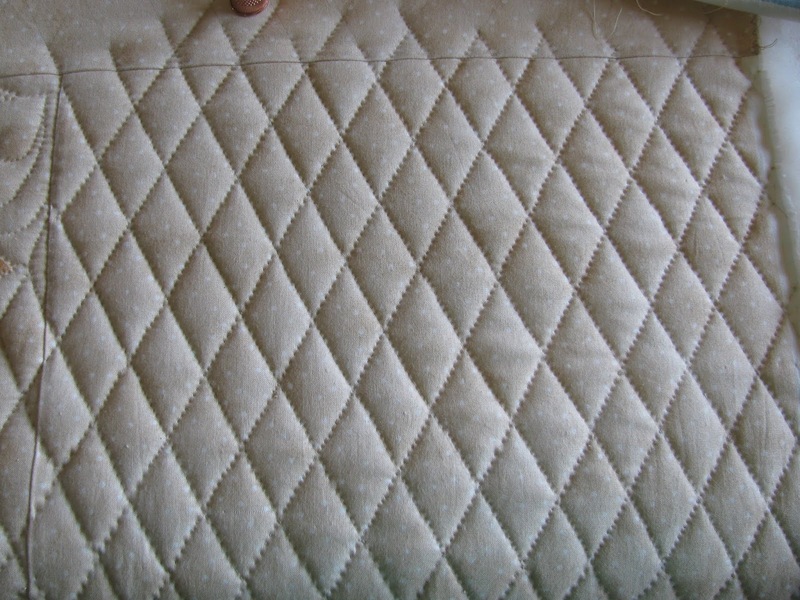 The batting was Quilters Dream Poly, mid loft which worked perfect. 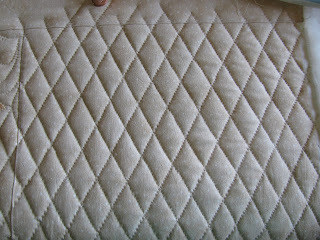 I like to use poly batting in crib/baby quilts, poly dries faster than cotton. 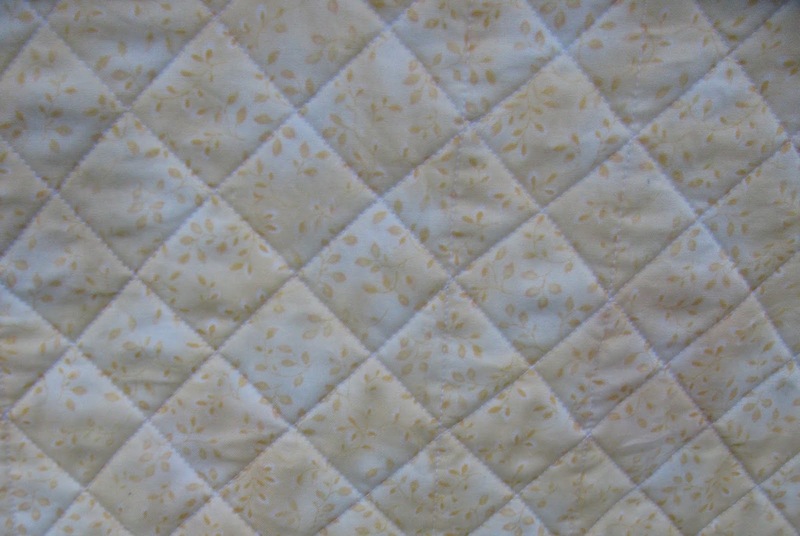 I didn't mark the quilting lines on this quilt, just eyed my line. I guess you would call the quilting 'organic wavy line' quilting. This is the glamour shot. We've been having drizzle so the ground was too damp for the tree stump photo. I used a blue and yellow stripe from my stash for binding. The finished size is 48" x 57". I like crib quilts large enough so when you're up with the baby at night, there is plenty of quilt for the baby and the parent. The plan is to keep this crib quilt until the perfect baby/toddler comes along to gift it to. I recommend this pattern for a fast, easy project. This is the applique block I was quilting when I wrote my my Sunday post last week, finished now. 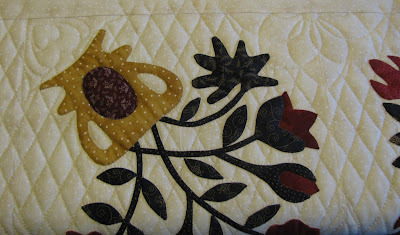 The last applique block to be quilted. This is what needs to be hand quilted before I'm finished. I've started quilting the top border. 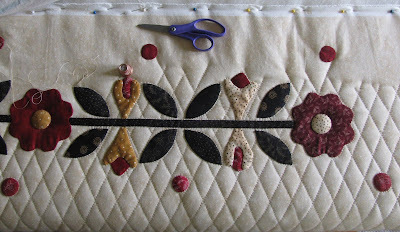 I'm quilting up to the applique. Moving along on the border. 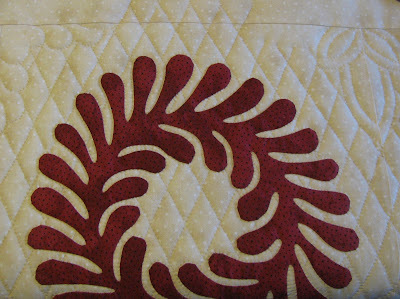 There are a few circles that have gotten quilted. The flower in the center is the halfway across the border. Do you see the empty thread spool laying on the left side of my thimble? Another 400 yard empty spool means I've quilted 800 yards of thread! This quilt holds the record for the most yards of thread I've ever used in hand quilting a quilt. The old record was 730 yards used on my Jane Stickle quilt. I know you've all been wondering how my Saturday trip to Chicago was. Here is my report. The show we were attending was an IQS show, the Chicago Quilt Festival, which is different than the AQS. You can look up AQS yourself. First of all, I didn't take any pictures of the quilts in the show. I didn't take any pictures there at all of anything. There are just too many quilts and wall hangings. There are so many different types of quilts, so many different techniques, it's rather overwhelming. But I did enjoy my day viewing all of the quilts. While I was viewing the quilts, I realized I've reached a new level in my quilting life. 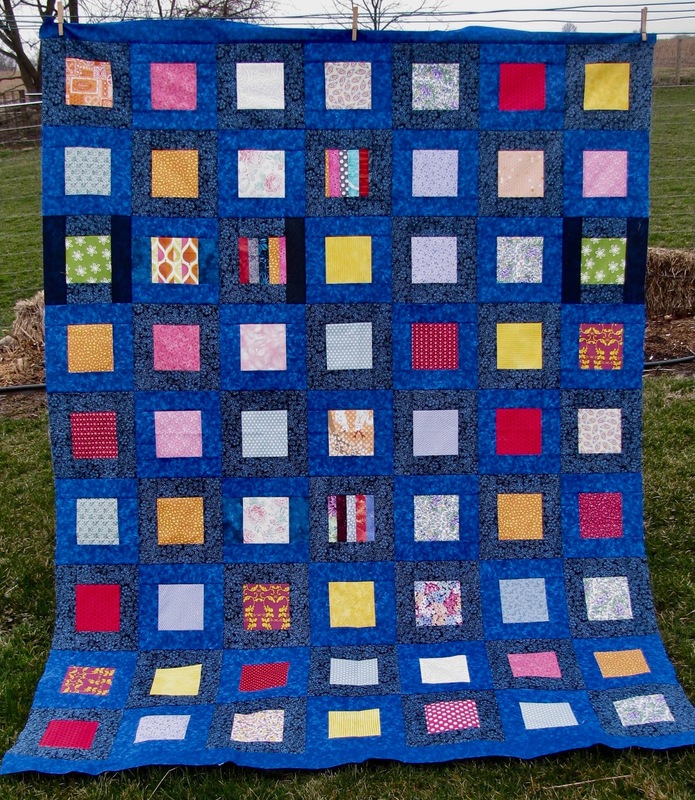 I no longer want to try to make every quilt I liked. I was content to peruse the quilts, smile with joy at the quilts I loved. I was impressed with the tenacity of sewest. Some of the quilts I wondered how they did what they did? I made some purchases at the vendors and here is the picture to prove it. At the Private Source Quilting booth, I purchased a 12" wool pressing mat. Of course they had a special show price. At the Primitive Gatherings booth I purchased Red & White Quilts published by Martingale. 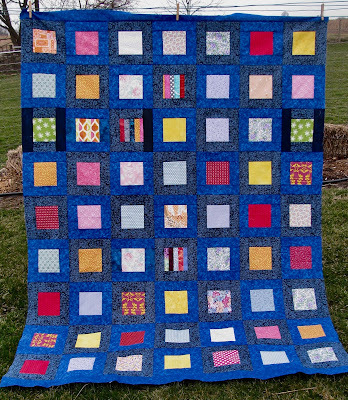 Of course, in my mind, I envision all of those quilts in blue and white. From the same booth I also picked up the Antique Little Lady of the Lake pattern. They had the antique quilt on view in the booth. Wouldn't she look lovely in blue and white also? From Super Threads, I picked up a package of Titanium Coated #80/12 needles. I thought I'd give them a try and see how long they last before they get dull. See the flower on the pressing mat? Clover had an area where they gave you the opportunity to try a different craft each hour. I was very tired all of walking so I decided to rest by trying a new craft. It was the hour for felt matting. I've never done this before and it was interesting. I doubt I'll get into this craft but it was an enjoyable experience. Since I've been home, the little square has been turned into a pincushion. I took the photo in front of a rotary cutter so you can get an idea of the size. I encourage you to gather up your friends and drive to a national show sometime. You'll have a great time! It's been 24 weeks since I've started quilting the Pastor's Attic quilt in October. Now it's the end of March and I'm still quilting. This is the longest I've ever had a quilt in the quilting frame. I'm writing this post on Friday afternoon because tomorrow several friends and I are driving to Chicago to the IQS show in Rosemont. I should make it clear, Lynn is driving, I'm a passenger. 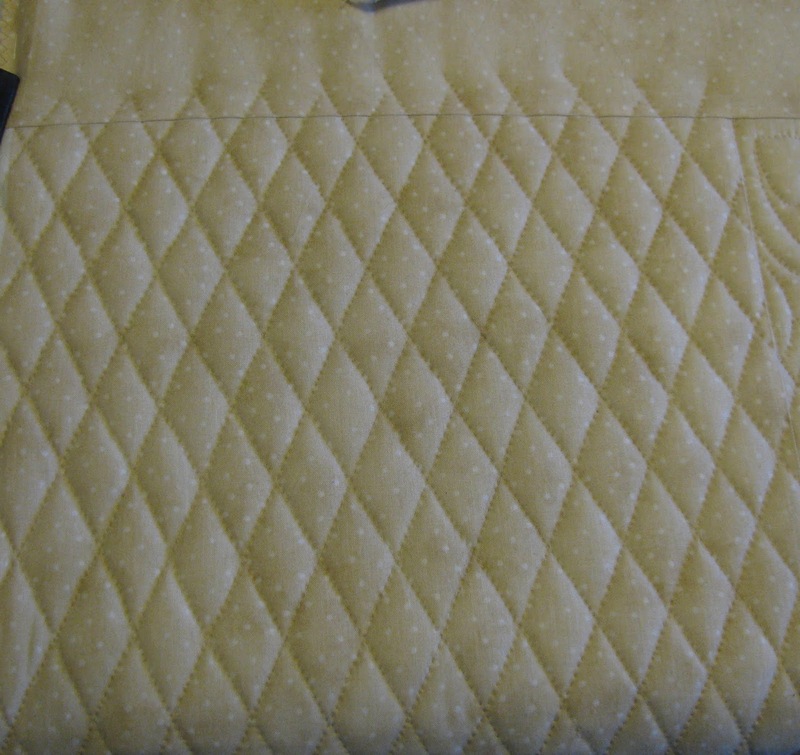 Surprisingly I did get more than half of a row quilted this week. Remember, the seam line in the top border. This is the left side border which was terribly boring to quilt. I was glad when I got into the applique. These blocks with larger pieces of applique quilt fast! 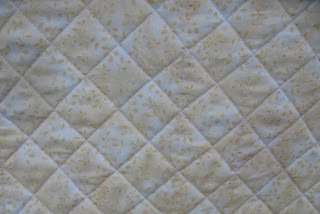 I enjoyed quilting this block much more than appliqueing all those fingers. 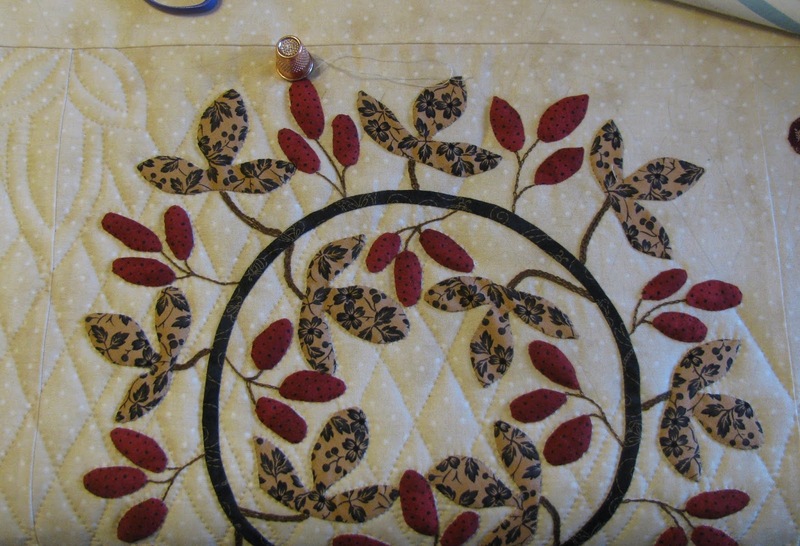 I can quilt faster than I can applique. This is the middle block of the row. This is where I am now. I'm sure I quilted Friday evening so more progress was made on this block. You'll see that next Sunday. 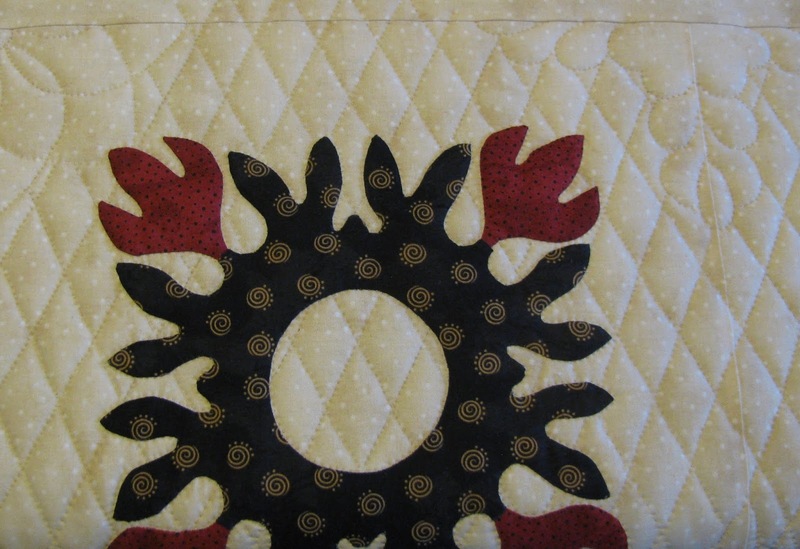 I've had some questions about the quilt and my quilting. Here is a link to the marking process. I've used a Hobbes wool batt for stitching ease. I love wool batts. Wool is my go batting for hand quilting from now on. The needle just glides through so smoothly. I use DMC #7 quilting needles. I like the DMC brand because the needle is a little thicker than John James which I bend. Most hand quilters like a smaller needle but I don't seem able to manipulate the smaller needles. They flip out of my fingers and gash my thumb just under the bottom of my thumbnail which then bleeds. I make small stitches with this size just fine, it's my personal preference. The thread I'm using is YLI brand thread. I'm using a variegated color called Pyramids but you can't tell it's variegated on the quilt. The ends of my fingers and thumbs are calloused so I'm able to quilt several hours a day but you don't start out being able to quilt that long. It takes time to build up the callouses. 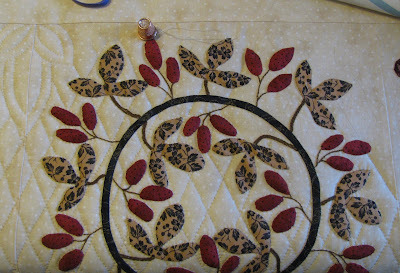 Another important issue in hand quilting is the backing fabric. I buy my backing from a LQS. I want to see and feel the fabric before I purchase it. 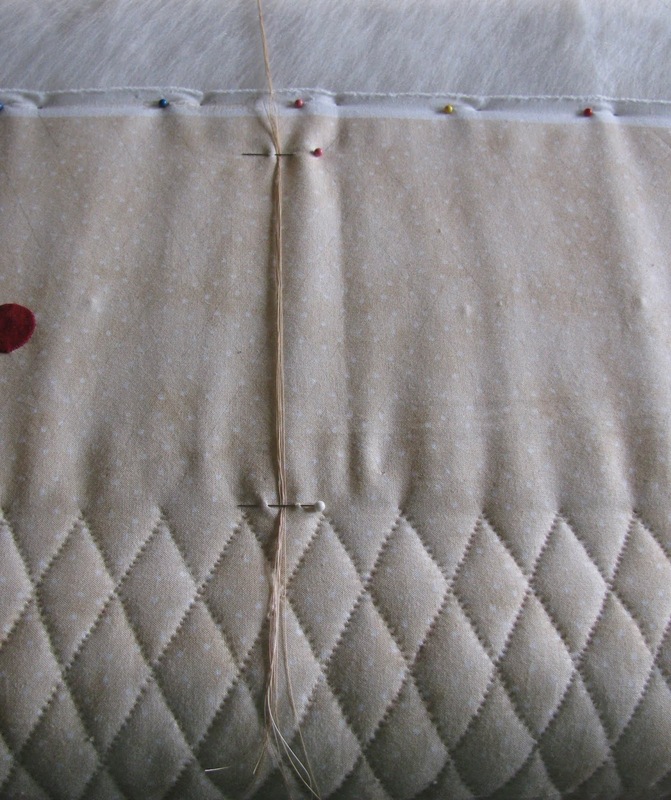 I don't want a backing that has been stiffened with sizing or starch. I know you can wash it but I don't think it washes out with just one wash. The sizing makes the stitching harder. 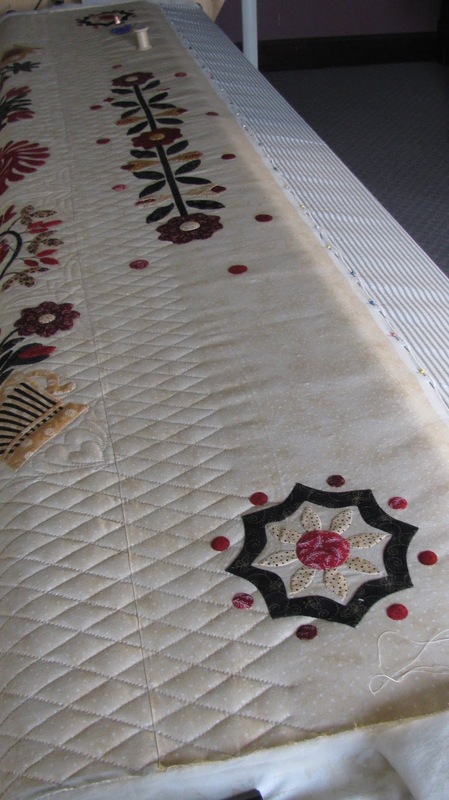 Also if you wash the backing multiple times, you're going to make the fabric shrink which will make the thread weave tighter which quilts harder. 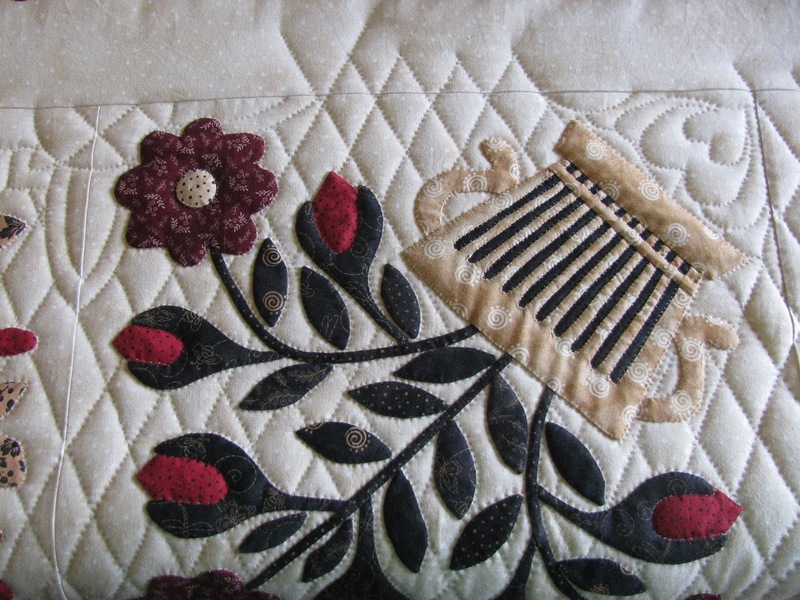 I hope I've answered the quilting questions. The local weather - the grass is still not greening up but tulips and daffodils are sending up green stems, spring is slowly coming. We've also had a skunk hanging around so when I head out to the barn, in the dark, in the morning, I need to make sure he isn't in the yard. I don't want any surprises of that kind!